The Daiwa Iprimi 56XXUL-S is a 5' 6" extra, extra ultralight solid-tipped spinning rod. It is a very soft, full flex rod that makes catching even small fish fun. When I first saw the rod's specs, I immediately thought about micro fishing, which has grown dramatically in the US in the last few years. This is the best spinning rod I have found for micro fishing. Even if you are not specifically fishing for micros, it is a fun rod for catching just about any small to medium sized fish. The ultralight spinning rods that are readily available in the US are overkill for smaller fish. Most are rated for lines up to 6#. Personally, I would consider 6# line to be "light" rather than "ultralight" and I suspect most diehard ultralight anglers would agree with that assessment. I truly believe that 6# line is just too thick and too stiff to give good casting distance and good action with small lures. I guess I should not have been surprised but a US rod manufacturer just released a series of "premium" ultralight panfish rods - rated for lines up to 6#. I guess that's what they think US anglers want. I think US anglers should rethink ultralight! The Daiwa Iprimi 56XXUL-S is rated for 3# line - maximum! The minimum recommended is 1.5# - which isn't readily available in the US, but is in Japan. It takes a very light line to get the full benefit of the rod's light lure rating, which goes down to .4 gram (about 1/70th oz). The Daiwa Vega .4 gram spoons do not cast far, but you can cast them far enough to catch fish. The Vega .8g spoons are the same small size as the .4g spoons but being twice the weight they cast a lot better. The Daiwa Lupin spoons are not much larger, but they weigh from 1.2 grams up to 1.8 grams (about 1/16 oz). They cast like bullets with 3# line. 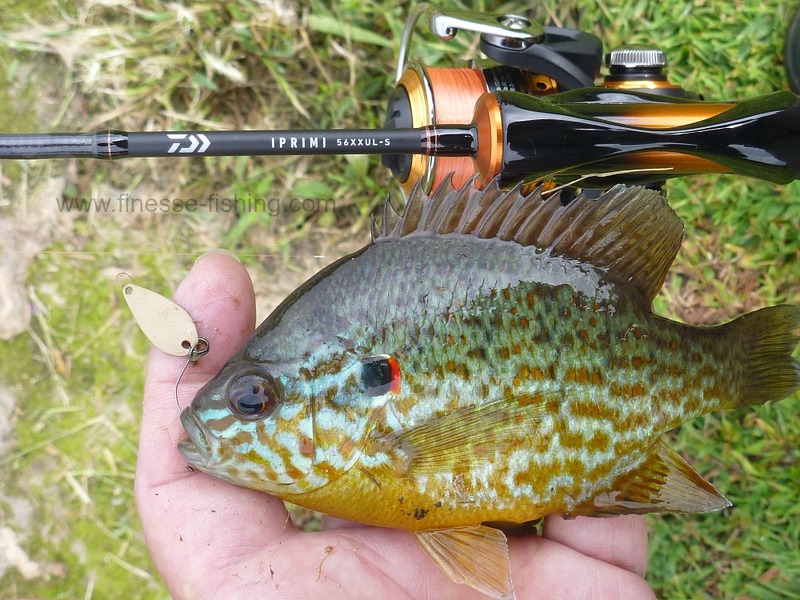 Pumpkinseed caught with Daiwa Vega spoon. The Daiwa Iprimi 56XXUL-S is rated for lures up to 2.5 grams, so you can also fish with larger spoons like the Daiwa Crusader or Shimano Slim Swimmer and Roll Swimmer. I have caught larger fish on the 2.5g Crusader spoons than I would want to tangle with using the 56XXUL-S, but the rod is more capable than you would expect an extra, extra ultralight to be. Smallmouth bass caught with Daiwa 56XXULS. 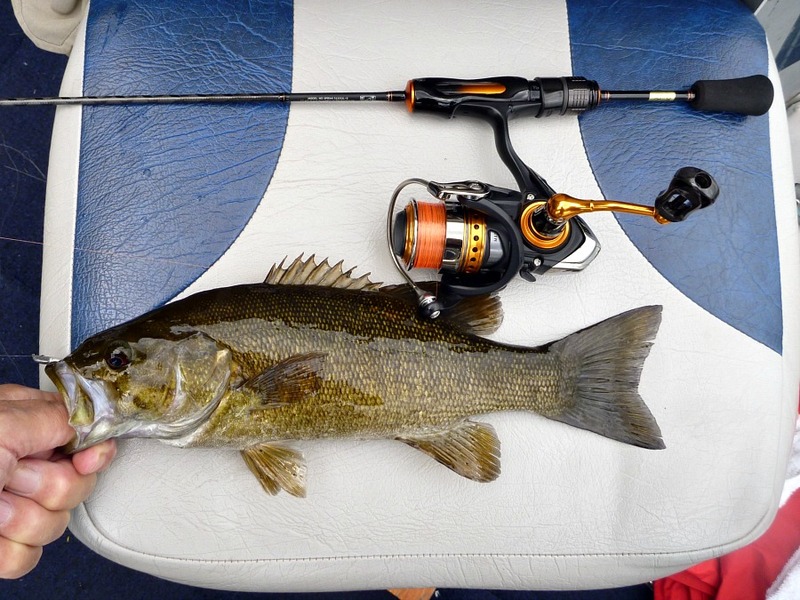 I took the rod to Maine last year on my annual smallmouth bass fishing trip - just to see what the rod could do. It did just fine. It is not a rod to pull largemouths out of weeds, but in an open lake it will tire a pretty good fish. In Japan, the rod is designed for use in Areas, which are private, managed pay-to-fish lakes. Some of the trout in the Areas are surprisingly large but they are also heavily pressured. Anglers routinely use small lures and very light lines. To protect the light lines, Area rods tend to have very soft actions and the Iprimi 56XXUL-S is no exception. 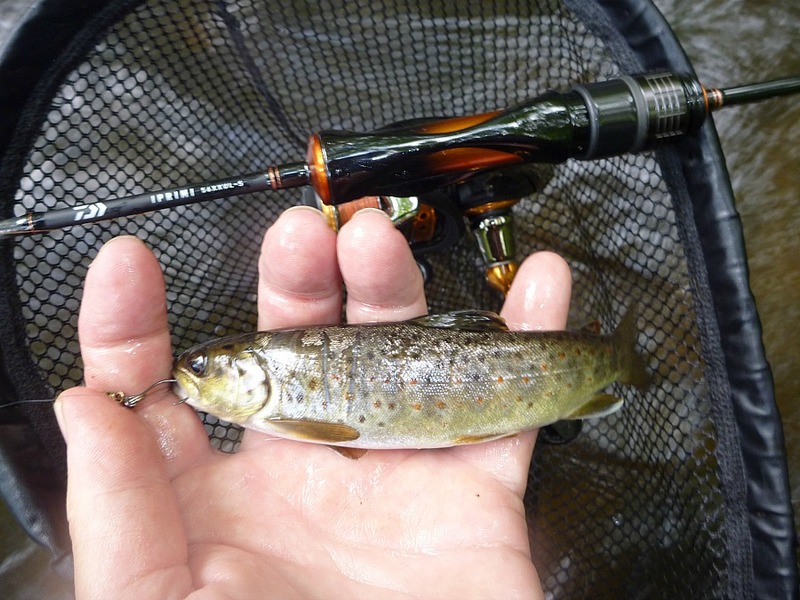 Little wild browns are great fun with the right rod. Actually, it is exceptional in one respect, and that is the length. Most Area rods are 6' long or a bit longer. At 5'6", the 56XXUL-S is one of the shortest rods intended for fishing Areas. That short length, combined with the extra, extra ultralight action, makes it one of the best rods for the headwaters streams here in the US, where the brookies or rainbows or browns are not going to be very big (but they probably will be very hungry). 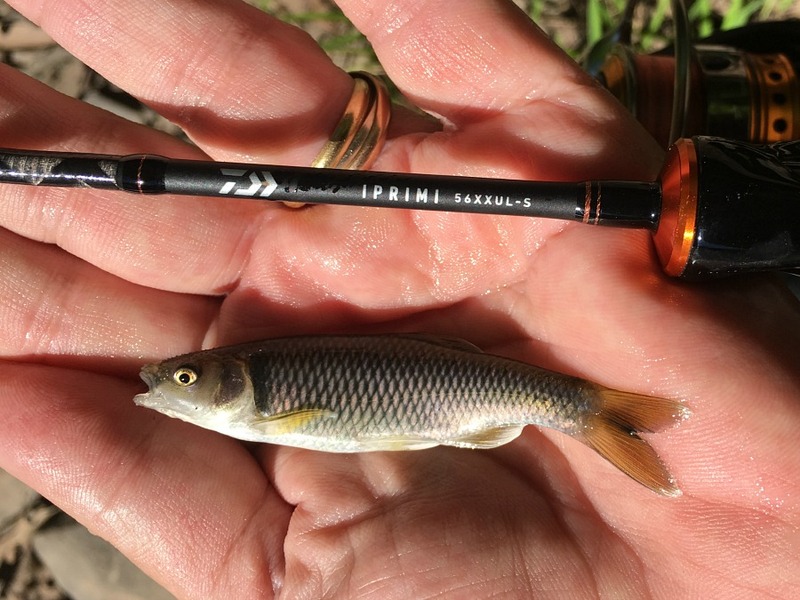 Whether you fish for trout in the headwaters, sunnies in the town park, or creek chubs in that little stream that no one else fishes, this is a rod that definitely will not be overkill for the fish you will catch. Truly, if you match the rod to the fish, you don't have to catch wall hangers to have a great day. Extra, extra ultralight? Think of it as extra, extra fun!